It is worth mentioning, for future reference, that the creative power that bubbles so pleasantly in beginning a new book quiets down after a time . . . Doubts creep in. Then one becomes resigned. Determination not to give in . . . keep one at it more than anything. 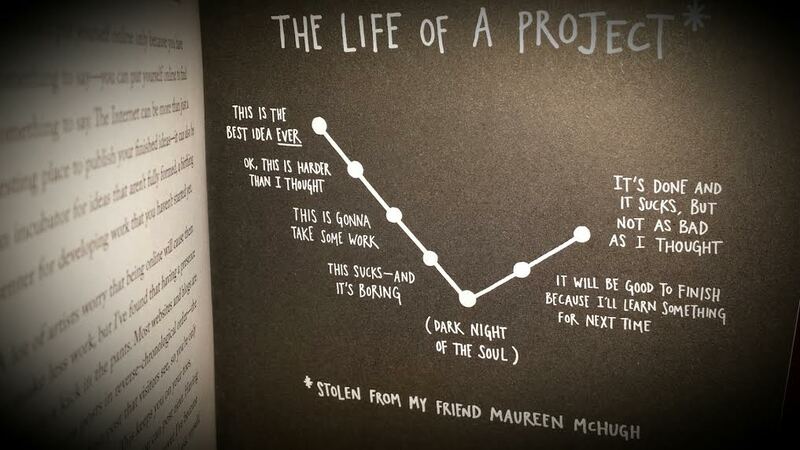 Austin Kleon put a modern spin on it with a line graph in his book Steal Like an Artist. Some determined artists weather even the most severe crises. But for most of us even ordinary, everyday crises stop us in our tracks. Most of these crises are internal, emotional, and existential, crises of faith and self-doubt, crises of self-recrimination and self-incrimination, crises of fear and meaninglessness. A marital spat or a single self-representation—calling yourself “untalented,” say—is sufficient to keep a person from writing the book she may otherwise be close to writing. The “middle of things” that people are always in is, first of all, themselves: their own mind, their own inner conflicts, their own skin. Sometimes it may seem as if nothing much is going on. You come home from work, have a little dinner, then turn on the television instead of turning toward the novel you hope to write. What exactly are you in the middle of there? Don’t you have a “perfectly free” few hours in which to write? Absolutely not. To believe that just because you have no particular errands to run or duties to perform means that you are somehow not trapped in your own personality and your own culture is not to understand what being in the middle of things means. You are always in the middle of your personality, always in the middle of your stream of consciousness, always in the middle of your culture. There is no exit. Unless you are impervious to the facts of existence—and no one is—you must learn how to create in the middle of things . . . You must learn how to create even if you hate your country’s policies or your own [writing] style. You must learn how to create even if you are embroiled in a bad marriage or living alone and lonely. You must learn how to create even if you work eight hours a day at a silly job or, sometimes worse, find yourself at home all day with time on your hands. Maisel told a story of the author James Jones, who was one of the lucky few to make a lot of money from writing. Jones was a generous guy and wanted to help “some poor writers he knew by giving them enough money so that they could quit their day jobs and write.” And do you know what happened to those writers who finally had all the time in the world to write? They didn’t write a single damned thing. Sign up for more inspiration and tips from a professional editor. This is brilliant. I am in the middle of revising what is sure to be a really crappy novel. But. It needs to be finished, that’s the deal. Then I can move on to the next. This inspired me, thank you. Hooray! Yes, finish that novel! The comments I love to read the most are from people who say they’ve been re-inspired to write. Keep on keepin’ on, and I hope to hear from you again! This is an absolutely awesome blog post by C.S. Plocher. A must read! Thanks so much for sharing, R. Floyd! Writing is part of – or the very heart of – marketing, Content Marketing, to be more precise. So if you want to market, first learn how to write! I found it concise and swift to the point. Thanks for sharing my blog, lunelit—it’s appreciated. I absolutely love the image. So true!